EDK2/TianoCore has a very complex build system. Part of that is to let developers use vastly different toolcains to build (GCC, CLANG, Visual Studio, ICC, XCODE). But it also provides different profiles for different versions of these toolchains. From the start, the ARM/AARCH64 ports were developed using ARM's commercial toolchain and GCC. Whereas on the Ia32/X64 side, most of the development has tended to happen with Visual Studio (GCC mainly being used for Ovmf). This means that for a developer moving from x86 to ARM, they have not only had to get used to a new architecture, but they've also had to deal with a new toolchain. Visual Studio 2017 has included ARM/AARCH64 support since release 15.4. Not publicly announced, and not complete - but sufficient to build firmware, and UEFI applications and drivers. And with release 15.9, the support is now public and complete. 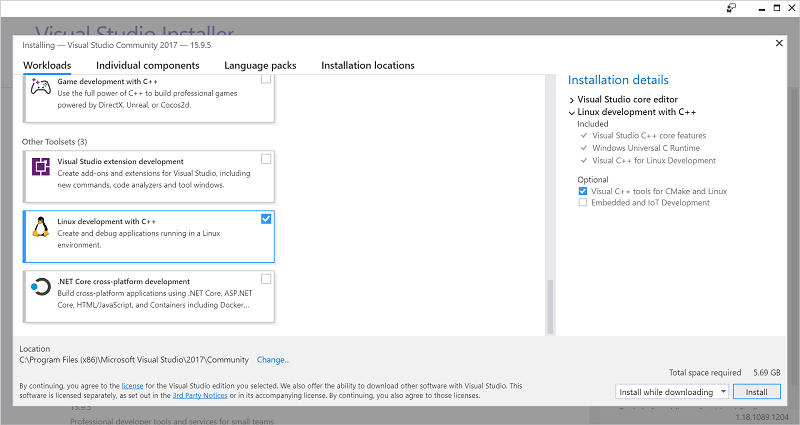 Which makes for a good time to ensure we can provide a familiar development environment for those already using Visual Studio. So I set out to make myself a development environment in which I could build all current architectures in the same environment - and in Visual Studio. And since I have my new ARM64 laptop, I'll make sure to get it working there. There is no native Visual Studio for arm64, but the (32-bit) x86 version runs just fine. Search for it in the Microsoft Store, or go straight to the download page. The Community Edition is sufficient, and is free (as in beer) for individuals or open source development. I'm not going to go through downloading and starting the installer and how to press the Next button, but a few things are worth mentioning. First, you don't need to install everything in order to get the basic toolchain functionality. I opted for the "Linux development with C++" toolset and ended up with what I needed. Second, make sure the components "Visual C++ compilers and libraries for ARM", "Visual C++ compilers and libraries for ARM64" and "Python 2 32-bit" are selected. Acpica-tools (including iasl for building ACPI tables) comes in a .zip file (32-bit x86). Rather ungracefully, the Visual Studio build profile simply assumes the binaries from this archive have been extracted and placed in C:\ASL, so do that. 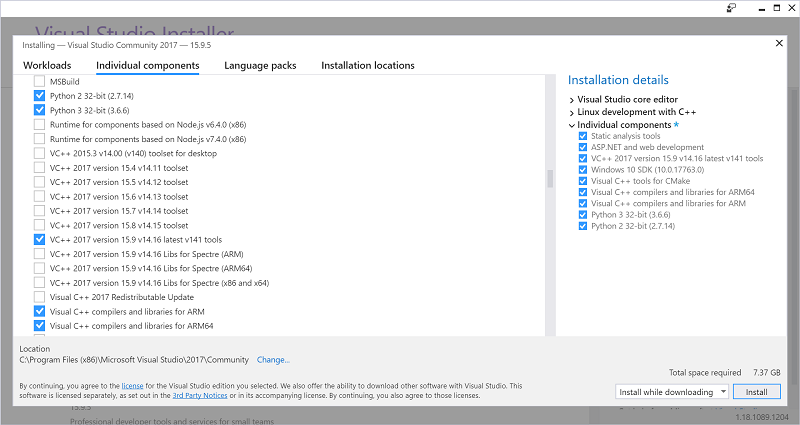 If you don't want to rely completely on the Visual Studio git integration, the 32-bit x86 variant available from here works fine. to build the native BaseTools and set up the build environment. This will complete with a warning that !!! WARNING !!! No CYGWIN_HOME set, gcc build may not be used !! !, which is fine, because we're not using GCC. Thanks to Pete Batard, support for building UEFI applications and drivers for AARCH64 was already available upstream. So for Option ROM drivers or UEFI command line utilities, you should be good to go. However, since we've really only used GCC/CLANG for the port up till now, we're lacking assembler files using a compatible syntax. In addition to this, when trying to build whole platform support, there are several issues with (ARM-specific) C source files that have never before been compiled with Visual Studio. I started ploughing through this end of last year - a hacked up version leaving many asm implementations empty (just so I could get through and identify all of the C issues) is available in one of my working branches. Of course, this appears to have suffered some bitrot (and change in behaviour with VS 15.9), so I will get back to that over the next few weeks. And as always, if you're impatient - patches welcome! For a very long time now, I have put effort into dogfooding. Back when I first started working at ARM in 2005, all available ARM platforms you might even consider using for normal computing were ridiculously expensive. But finally, in 2008, something changed. On a long and lonesome highway... Err, nevermind. Anyway, after nearly 12 and a half years, Friday 11 May 2018 will be my last day at ARM. I'm not going very far - after a short break I will be joining Linaro as a full time employee on 21 May. OpenPlatformPkg is dead, long live edk2-platforms! For a few years now, I have been working towards improving the availability of open source platform ports and device drivers for EDK2.